February 2nd is Chandeleur day in Europe, it is a day of purification after winter when all candles are lit in celebration. It marks the end of winter and was officially the first day of the sowing season. Hence, the tradition to use up left-over flour to make crêpes. Apparently, you can test your good fortune for the coming year by holding a gold coin in your left hand while you flip the crêpe in your right hand. If you can land the crêpe back neatly in the frying pan, your prosperity is assured for the new season. The batter is made from 3 large beaten eggs and 1 tsp sugar, a pinch of salt, 1+1/2 cup homo milk, about 2 tbsp melted butter, all mixed well together. Then, add one cup of flour (all purpose). Stir with a whisk until perfectly smooth. Let sit on the counter while you start a frying pan on medium low with a tsp vegetable oil spread with a brush. Wait about 3/4 minutes for the oil to be on the verge of smoking. Very quickly stir the batter and pour 1/4 cup (for an 8/9 inch bottom pan) in the pan. Pick up the pan and tilt it in all directions to spread the batter and fill the pan. You have to be fast. Put it back down on heat set between Medium/low and medium ( on the Viking gas range anyway). In about one minute, you can see the edge turning golden, it is time to flip the crêpe. Grab the pan and give it a good forward and up thrust for the flip. Maybe do it a few times before you try the coin trick! Or if that fails, a spatula does just fine. Wait another minute or so and transfer the crêpe onto a heated plate reversing it so the smooth side is at the bottom and becomes the outside when you roll the crêpe. Fill with a small nugget of butter and 2 tsps sugar, roll and eat. Heat the pan again adding a squirt of oil and repeat adjusting the heat if necessary. Some people say the first crêpe should be thrown away as it is never perfect, but actually, if the pan is heated right, that is not necessary. This is enough for about 8 to 10 crêpes. 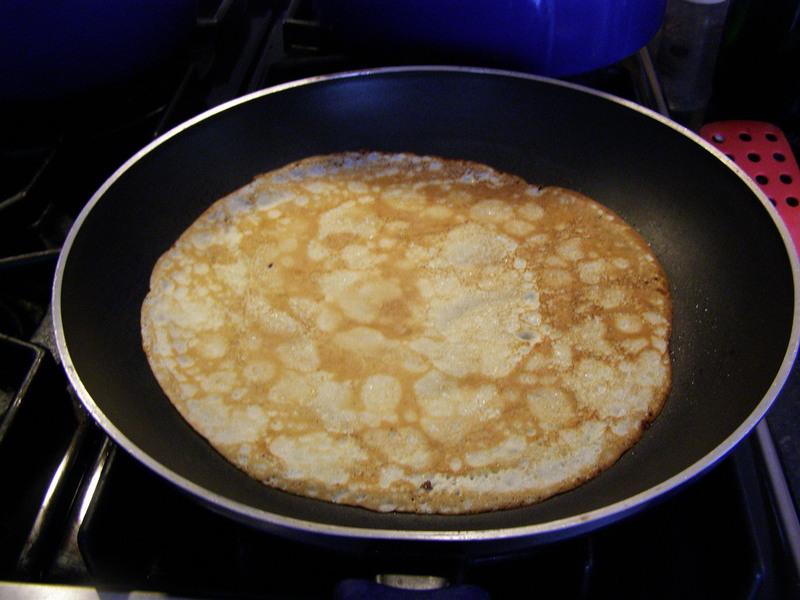 Always stir the batter before taking the amount for the next crêpe, otherwise the last ones will be too thick to spread. Other nice fillings are jam, whipped cream, lemon juice and sugar, nutella, chocolate, honey. This entry was posted in Baking, Dessert and tagged candelmas, chandeleur, crêpe, crepes, dessert, food, french crepe, verygoodrecipe. Bookmark the permalink. 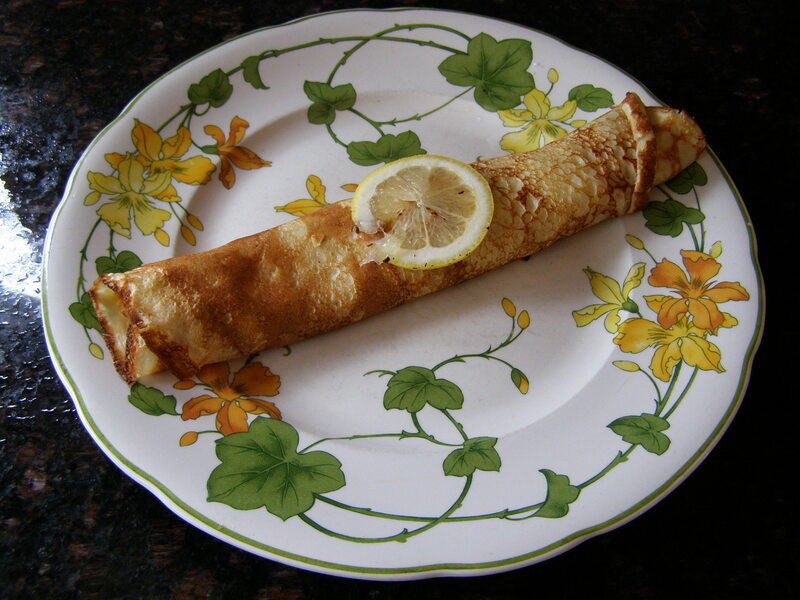 6 Responses to French Crêpes are always fun to make! This post led me to research Candlemas – which is what we call the day – and to organize a Candlemas celebration with an out-of-town friend. We are gathering tomorrow and having a dinner of crepes (a crepe dish for every course) with a blaze of candles to cheer us up in the dead of dreary February. We’ve already decided that it might become a ritual (excuse?) to ensure that we have a visit at this time of year. Thanks for the inspiration!! These were soooo delicious. Thinking of making them today!